If you are the person who’s in charge of making sure that people participate in a particular type of event, then you’ll want to be clarified on who managed to arrive and actually took part in it and those who weren’t able to go. The best way for you to gain this information is if you have a document where you can gather these people’s signatures. You may also see printable sheet templates. 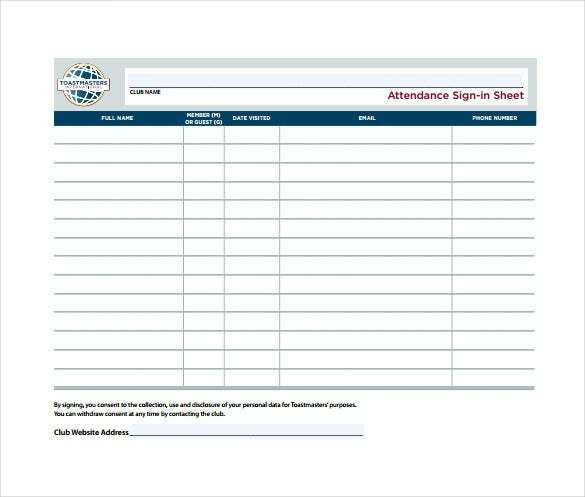 This would mean that you’re going to have a to create Sign in or sample attendance sheet as this document will help you keep track of the people that have arrived when they arrived, and the total number of people that actually participated. 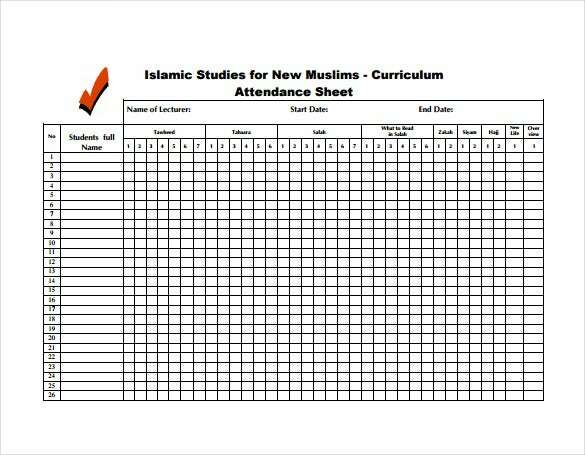 This article is going to focus on teaching you how to create your very own attendance sheet. As previously mentioned, the point of having Sign in sheets is so that you can keep track of the people who are on the list, but there’s more to it than just that. So, here are a number of other reasons as to why Sing in sheets can be very important for daily use. You may also see meeting sign-in sheets. Let’s say that you’re a teacher and that you’re in charge of making sure that all of your students are present when it comes to participating in your lecture. You’ll need to know those who aren’t present as this can highly affect their grades. Having a Sign In sheet can come in very handy for this type of situation as it can help you see which of your students weren’t able to attend the lesson. Also, this is very helpful in the event that there are any discrepancies when it comes to one’s absence. Say we’re in a situation where an employee of a company was marked absent by his or her supervisors for not participating in a required employee training, even though the employee actually did take part in it. So long as the employee has managed to place his/her signature within the Sign in sheet, then this little issue can easily be resolved by both parties. So overall, it can help you see who weren’t able to participate in important events and it can help people solve problems when it comes to their attendance. Both managers and supervisors have the important responsibility of making sure that they know which of their employees regularly participate in their work duties and those that often take leaves of absence. Every employee has their own shift schedule and it’s the job of their employers to oversee their work. So, if an employee weren’t to show up for his/her shift, then the employee’s supervisor will need to first check the attendance sheet and see if the employee really did or did not sign. If there isn’t any name, signature, or any piece of information that can verify an employee’s attendance, then the supervisor may then confirm that the employee was not present. 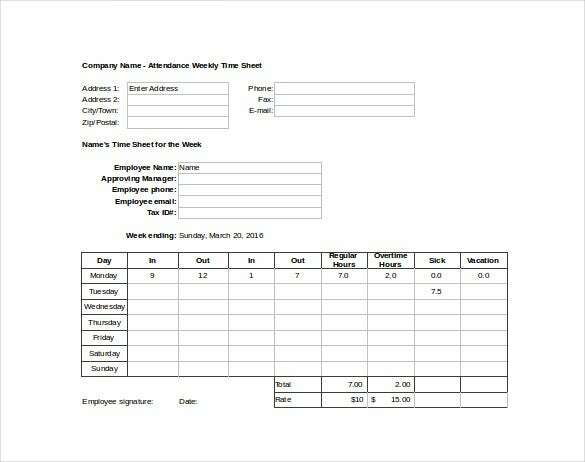 It’s very important that both managers and supervisors take note of the Sign in sheets as you’ll never know when an issue might come up regarding an employee’s attendance. There will be times where you come across people who take one too many absences which could then lead to a ton of problems for a company in terms of production or performance. 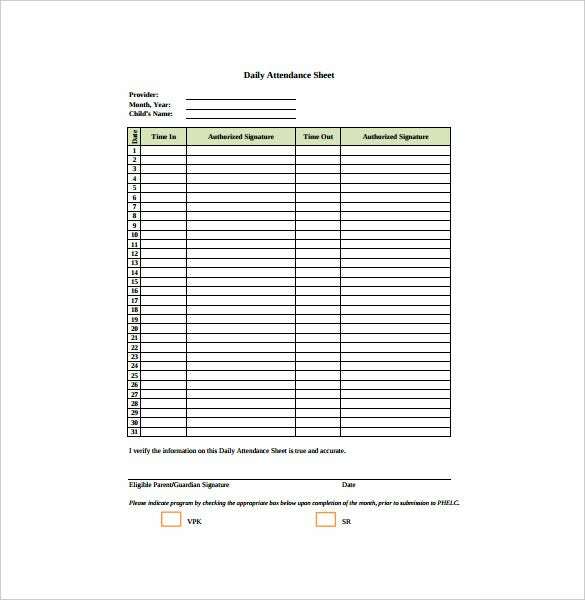 Something like this cannot continue so if you’re the person who has the authority to take up disciplinary action against another due to one’s continuous absences, then the first thing you’re going to need is the Sign In sheets. The reason for this is because you need to be able to justify the disciplinary action with the appropriate evidence, meaning that the Sign in sheets should have everything you need to prove that the employee has failed to cooperate with the absence policy of your business. So long as you have these Sign In sheets, then you shouldn’t have to worry about the employee charging you for unfair disciplinary treatment. Also, the consequence should depend on the severity of the situation. If you need help in knowing what kind of disciplinary action you should take, then you can always look up your company’s policy regarding employee absences. In the event that you’re going to create this type of document, you’ll have to make use of a program that can help you. People would usually go with spreadsheet programs when creating Sign In sheets and the one that’s commonly used is Microsoft Excel as it has just about everything one could need to make the document as well as having an easy-to-use interface. So once you’ve downloaded and installed the program, then the next step is to create the Sign In sheet. The first step you’re going to take is to open up Microsoft Excel and start by adding labels for both the attendance and the names of the people. You can place the names in the different slots in whatever way you wish, but it’s best that you do so in an alphabetical manner as this can help you in the event that you have to see whether a specific person was able to sign the sample Sign In sheet or not. Write down all the names of the people you need to keep track in separate boxes. After you’ve added in the names, the next step is for you to add the dates and format them. If your event or your schedule does not include any weekends, then it’s best that you don’t include them in the Sign In sheet. Start by entering a date in the following format of month, date, and then a year. Once you’re finished doing that, all you have to do is right click on the date and click on “Format Cells.” You may also see training sign-in sheet templates. Then you’re going to have to choose the number tab and click on the option that’s called “custom”. This will then allow you to add the day of the week to the date format. You can add in the dates in whatever way you please so do so in a way that you’re most comfortable with. All you have to guarantee is that the free Sign In sheet is easy for everyone to understand so that the people who have to sign in won’t run into any problems or ask questions. While you could always go to the far right section of the worksheet to have the total attendance tally, it’s much better and much easier on your end if place it right beside the name of the person in the Sign In sheet. Where you place the total is entirely up to you as you can also decide to place it at the far right side, but most find it easier to just place it right next to the numbers to their respective names. So what you’re going to do is that you’ll need to So, highlight column B, then right-click and choose “Insert” to add a column. Label this column as “Total”. After which, you must then add some lines and you can decide to color code it so that you may easily distinguish the total number of their attendance from each of the different people that are on the list. This will help avoid any confusion or mistakes that could be possibly made such as marking someone as not present even though that person was indeed there. You may also like sheet templates. The next step is that you’ll need to select the entire area of the sheet and keep a few empty slots in the event that you may need to add some additional names to the list. Once selected, go to Grid (under the Home tab) and select “All Borders.” You may also see visitor sign-in sheet templates. After you’ve finished adding in those extra columns, you may then proceed to add color to the Sign In sheet. Only add these colors whenever there is an empty slot that needs to be filled up. When you’re done adding color, next is that you’re going to have to create a formula to total up the attendance of every person on the list. In the first slot for Total, enter =SUM( and click on the first date box. After that, use Shift + Right Arrow to scroll to the end of the row, then press Enter. An easier way of doing this is to use a mouse to click and drag everything, but there are some who may not prefer this. Now drag that box down from the bottom-right corner to the last entry (this includes any of the blank slots that you have allotted for future names that you put on the sheet). 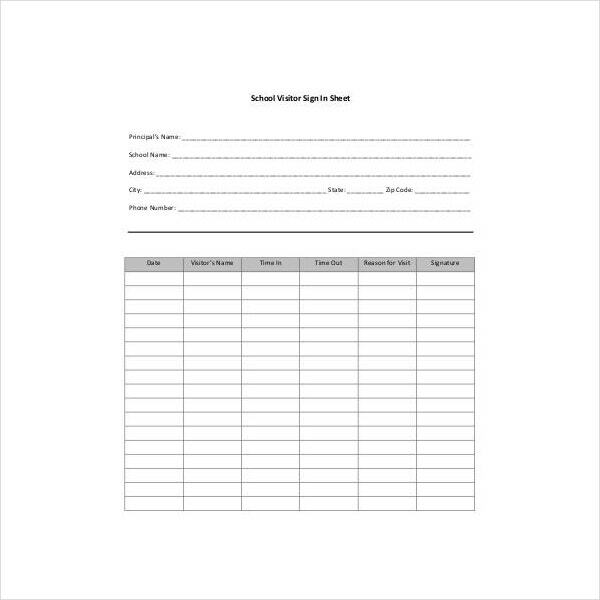 You may also like volunteer sign-in sheet templates. If you want to see if your formula works, then you can test this out by adding numbers to any of the boxes. If you see a total after inputting the numbers and that it’s accurate., then that means your formula is working. 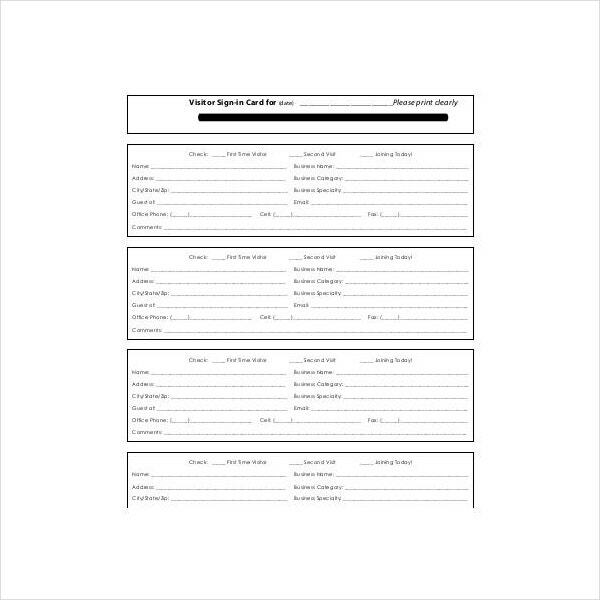 You may also see employee sign-in sheet templates. Once you’ve done all that? All that’s left to do is to print the Sign In sheet and you’re good to go. 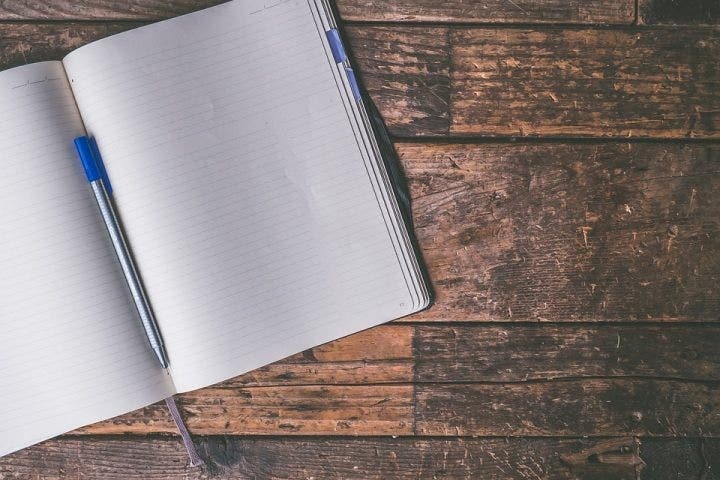 If you would like to learn more in regards to how you should go about in creating Sign In sheets or anything related to this particular topic, then all you have to do is go through our site, find the articles that have the information you need, and utilize the information to help you out. You may also see patient sign-in sheet templates.